Last week, Britain’s Mail on Sunday newspaper reported that Tony Blair had finally apologized for the Iraq war. This week it claimed that ministers in the Blair government ordered that a written legal opinion that the war was illegal be burned. With controversy raging over the endlessly delayed Chilcot report on the Iraq war, pressure on the former British prime minister is relentless. But the Mail got ahead of itself in proclaiming that Blair had apologized. 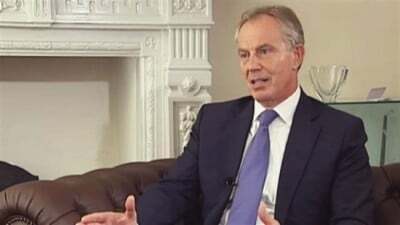 In an interview with the US television channel CNN, he acknowledged that the rise of Daesh may not be unconnected with the war but came nowhere near to admitting that British intervention in Iraq was a terrible mistake for which he was to blame. Cynics assumed that, with an announcement imminent about the publication date of the Chilcot report, Blair was anxious to pre-empt leaked indications that it underlined his culpability. However, the inquiry’s chairman, Sir John Chilcot has now confirmed that his report, already six years late, will not appear until the summer of 2016. For the moment, the only thing known about the report is that it is of prodigious proportions. The truth is that Blair cannot bear to go unnoticed. Though narcissism is scarcely unusual among politicians, Blair’s appetite for self-exposure long ago signaled that his own brand of it is extreme. Characteristically, narcissists are fantasists who live in a world of their own. What is extraordinary in Blair’s case is that he persuaded the Labour Party and a large swathe of the British public to share his fantasy — with woeful consequences when it came to foreign policy. Under Blair, the Labour Party made a fetish of PR and spin. In concert with his director of communications, Alastair Campbell, whose appetite for publicity rivals his own, Blair became obsessed with “micro-managing” the news, with controlling the media “narrative.” The narrative on Iraq projected him as a messiah with a mission to rid the world of a tyrant who was oppressing his own people dictator and threatening the west with weapons of mass destruction. Blair still speaks as though he personally toppled Saddam Hussein. In a BBC radio program on the Chilcot inquiry, the journalist Peter Oborne highlighted how Blair bent the truth. The former United Nations’ weapons inspector, Hans Blix, explained how Blair transformed the uncertainties in his report on Iraq’s WMD into absolute certainties. A veteran diplomat, Blix stopped short of saying that Blair lied but had no hesitation in saying that his findings were systematically misrepresented. Another contributor to the program, Sir Stephen Wall, Blair’s European Union special adviser, recalled how the Blair government twisted the words of French President Jacques Chirac, briefing that France would not support military action in Iraq in any circumstances when Chirac had in fact declined to back it on the basis of the existing evidence. While making no reference to orders to incinerate awkward documents, Wall also remembered how Blair’s Attorney General, Lord Goldsmith, faced intense pressure to alter his original determination that military intervention was illegal. Peter Oborne pointed out that no audit on Blair and Iraq could ignore the verdict of Eliza Manningham-Buller, the former director of British internal intelligence, M15, that the war produced the opposite effect to the one promised by Blair. Instead of lessening the terrorist threat to the UK, it greatly exacerbated it, obliging the security services to seek a massive expansion in their resources. Yet the British preoccupation with Blair’s betrayal of public trust can smack of national narcissism, a wider detachment from reality. After all, if Blair owes his own people an apology, what of the apology he owes to the people of Iraq — not to mention to the Palestinians, whose friend he affected to be in his fruitless latter-day incarnation as the West’s Middle East Peace Envoy? Moreover, what does it say about a country capable of re-electing such a politician in the face of mounting evidence that he had manipulated the British parliament into endorsing a calamitous war of dubious legality? Blair may have much to answer for, but so too, perhaps, does the nation that for 10 years placed its destiny in his suspect hands.